Hey folks! My name is LocoPojo – you may know me already from my Eternal Basics series on Youtube. Welcome to Scion’s School, my column for RNGEternal. This series is focused on providing basic strategy tips for new and incoming players to Eternal. For those of you boned up on your basics, I will also be discussing crazy deck brews on Fridays in the form of Eternal Brews. We will alternate between these two columns each week. Enjoy! If you’re going to conquer the Eternal Throne, you’ll need an army. While there are exceptions to this rule, most games of Eternal are dependent on the actions and reactions of what we call units: the soldiers, gunslingers, monsters and magicians of the world. Units offer a continual advantage to players that persists after they are played, meaning that the player who has the bigger army gets to make easier choices and is far more likely to win the game. Today we’re going to talk about one of the key basics of Eternal – how to manage attacking and blocking in a way that leaves you with the bigger army. First off, we need to go over the rules of combat. If you’re an old hand at Magic: The Gathering, you probably recognize most of the steps here, but if you’re a Hearthstone adept or new to card games you’ll want to pay attention to this part. A quick note on terminology for CCG players: Units in Eternal have two combat stats: Strength (the Sword icon on the bottom left of a unit) and Health (the Heart icon on the bottom right). Magic players call these Power and Toughness, and you’ll see lots of players use these terms even though “Power” is Eternal’s resource term, analogous to mana from Magic. The Hearthstone equivalents of Strength and Health are Attack and Health. If you see any confusion around these terms, remember that Power is a resource you spend, Strength and Health are your units stats. We here at RNGEternal try to remain faithful to the Eternal nomenclature in all of our writing. There are three steps to any combat in Eternal that you can interact with: Attacking, Blocking, and The Part Where It Gets Crazy. Units in Eternal can attack only one target – your opponent’s face. They do so once per turn, in a single, combined attack where you declare each attacker in an all out rush. Once all attackers are declared, we proceed to blocks. Once attackers are declared, your opponent will get a chance to summon Ambush creatures, cast fast spells, and then choose what units on their side of the board to block with. They can assign any number of blockers to an attacker – a dozen 1/1s can all pile onto a 12/12 for a fight – but each unit can only block one attacker at a time. After attackers and blockers are declared, both players have a chance to play additional fast spells to influence the final outcome of the fight. If your opponent casts a trick, you will always be able to respond with one of your own if you can pay for it – even if you previously chose to pass this step. After these three steps, the fight is resolved and everything that’s destined to happen, happens. The attackers and blockers all simultaneously do damage to each other equal to their strength, and those that take damage equal to or greater than their health go to the void. If an attacking unit can’t do enough damage to kill all of its blockers, the attacker gets to choose where the damage is distributed by selecting which blockers to damage in order. If neither player died, any Entomb or Infiltrate effects trigger after all of the damage is dealt. Then, the attacker plays out the rest of their turn as normal. That’s all the basic steps you need to get through combat in Eternal – pick your attackers or blockers, watch for your opponent’s tricks and play some of your own. But it’s in the details of these basic steps that things can get complicated – and fun! While the primary goal of combat is to reduce your opponent’s health to 0, there’s a secondary goal here that you should always keep in mind – to trade units with your opponent, sending some of theirs to the void in exchange for some of yours. If you’re trading your 2/1 for an opponent’s 3/2, you are putting your opponent at a disadvantage in size. If a 5/1 Pit Fighter forces a block with your opponent’s 2/5 Feln Bloodcaster, that’s two cards your opponent won’t be drawing later off Bloodcasters ability. If a 4/4 unit is blocked by two 2/2s, that’s two cards your opponent has spent from their hand to deal with just one of yours. And if you pay 3 for a Scorpion Wasp to block an 8 cost Scion, you’ve netted a significant advantage in power efficiency and gotten rid of one of your opponent’s best victory conditions. Forcing good trades gradually builds your board and hand advantages until you reach a tipping point where the game becomes yours. If you are an aggressive deck, even trades also come out in your favor, as they keep the board clear of detritus that blocks your path to victory. Even bad trades, like spending a combat trick and a unit to kill a large blocker, can be a potentially game-winning play for an aggressive player. You should encourage trades whenever possible if you know they will be to your benefit. 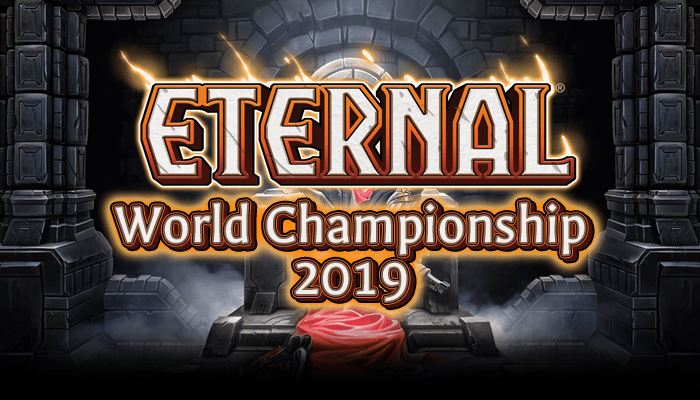 Eternal heavily encourages trading and attacking with abilities like Quickdraw, Warcry and Overwhelm which all work better on the attack – it is frequently the best play pattern to force these interactions. While you should always keep your opponent’s health in mind, trading will be the most common form of interaction in each combat. Let’s talk about how to get the best trades on offense and on defense. A common question in card games like Eternal and Magic is “Who is the beatdown?”. Usually, the player with the faster deck will have a higher win chance if they stay aggressive, while the slower deck will benefit more from playing defensively until the board tilts in its favor. But it doesn’t always pan out that way. There’s a lot of weight to this question, enough for a separate article or three, but here’s my first two cents: if you can trade evenly or better on an attack, you should usually be attacking. If the trades you are making are bad ones, that should give you pause – but consider attacking anyways if you have a path to lethal damage. If you can kill your opponent in one or two turns, it’s not going to matter that you lost some cards along the way. Indeed, the most common mistake made by pros and newbies alike is not realizing when it is their time to attack. Every point of damage that you can get through puts your opponent on a clock, giving them that many less turns to kill you. If your clock is shorter than your opponent – if you can kill your opponent faster than they can kill you – why play defensive and let them build up an advantage, or find that one card that they need to combo out? Allowing your opponent to build a wider board gives them better blocks and better trades – attacking keeps them honest and keeps the board state simple and in your favor. So, as you are learning: favor aggression. You’ll make more mistakes that way, but it’s easier to learn from making mistakes than from standing still. You’ll also win more games this way, because even inefficient attacks can add momentum towards the goal of reducing your opponent’s health to 0. As it turns out, the best counter to most strategies in Eternal is to kill your opponent before they can perform them. Caution should be a learned instinct, not a default state. Use your army! Combat tricks in Eternal generally consist of Fast Spells or Ambush units that influence the battle in some way. They can be cast after blockers are assigned, turning the tide of the fight in the favor of the caster. Tricks usually take the form of buffs to your unit (like Finest Hour or Rapid Shot) or cards that remove or weaken your opponent’s unit (Detain, Annihilate, Teleport, or even a stun effect like Flash Freeze which removes the unit from combat). While removing a unit assigned as a blocker will still prevent the attacker from dealing damage (unless your attacker has Overwhelm), it can be extremely powerful in situations where your opponent has chosen to block with more than one unit. I recommend that you note down all of the fast spells that can easily be played at one or two power, namely cards like Annihilate, Torch, Finest Hour, Rapid Shot, and Teleport. If your opponent makes an attack that seems strange, check their power and influence and see what kind of fast spells they can play. If you don’t have them all memorized, you can always search “Fast Spell” in Eternal.cards and keep it open in another window. Play those cards out in your head and determine how they influence the fight. By design, there are extra pauses in Eternal that indicate when your opponent is holding on to a fast spell or Ambush unit that they are able to cast. They happen at the end of your turn, during attacks and blocks, and (in the case of fast spells) in response to other spells or Ambush units. Even if they pass on casting these cards, the pause can always be read. Noting these pauses is the minor equivalent of reading your opponent’s face in a poker game: it is a clear tell that they are holding on to some sort of trick. Keep an eye on these pauses and remember when they appear and don’t appear, and you’ll have a better idea of what kind of tricks are up your opponent’s sleeve. A final note on combat tricks – always play units that don’t influence the fight after combat. There’s several reasons for this (hiding information from your opponent that they might need to make the best blocks, for example) but the most important one is that combat tricks like Torch and Annihilate can affect units outside of combat. Keep those units safe, don’t play them until it’s optimal to do so. If you have a 3/3 that you know you’re not going to block with, and your opponent has a 1/4 that they’re definitely not going to attack with, you might consider swinging in with that 3/3 anyways. This is a bluff – you’re expending a possible defender for a turn to bounce off a 1/4 – but if your opponent suspects a combat trick, they may let you through anyways. As a more dangerous trick, say you’re attacking with a 2/2 into your opponents 3/3. Your opponent is going to know that something is up, and depending on how much they value their 3/3, they may let your 2/2 pass. You need to weigh the risk and reward of these types of attacks very carefully, especially since – as you are starting out in Eternal – some players may never see past the great trade you are offering them. This kind of bluffwork is difficult and relies on the timing of your plays fooling your opponent, so start small and consider the risks carefully. That’s enough about offense. Let’s talk a little about defense. It’s sort of like a 5/5. We said previously that building a wider board gives you better trades. There’s a reason for that: the multiple blocking system. Multiple blocks are a key facet of Eternal and one that you’ll be employing very frequently in this game. Even Magic players who are familiar with the system will have to better develop this skill to excel. Multi-blocks are especially beneficial in making better trades for units larger than you. For example, say two 3/3 Argenport Instigators block a 5/5 Rhinarc. One Instigator dies, trading 2 power of cards and 6 points of stats for your opponent’s 5 power and 10 stats. Because the second Instigator lives, it now has a clean board to attack, meaning it can pressure for damage instead of being unable to attack into the larger unit. Advantage! The wider the defenders board, the more advantageous choices they can make. These choices depend on your opponent not having a trick of their own, though – a Finest Hour turns that advantageous trade into an extremely disadvantageous 2 for 1. It’s for reasons like these that it’s often beneficial to simply pile units onto an attacker. If your opponent is swinging in with one 2/2 and you have a bunch of 4/4s, there’s clearly some sort of trick in the mix such as Rapid Shot. So what’s the hurt in blocking with more than one of them? Your opponent will either decide not to play their combat trick and you’ll have picked up the 2/2 for free, or they will spend the trick and you will trade a 4/4 for a 2/2 and a trick. Win-win! However, remember that multi-blocking is inherently dangerous as well, as if your opponent’s trick is good enough they may be able to net 2 for 1 exchanges that leave their unit smiling. Be especially wary of shadow decks, which have a lot of removal spells and the spell Rapid Shot, one of the stronger combat tricks in the game. Here’s another scenario: your opponent has 1 power left and is attacking you with a 4/4 Navani Warsinger. You have two units in play: a 5/5 Rhinarc, and a 3/5 Black Sky Harbinger with Lifesteal. You’ve seen some of your opponent’s hand with a Sabotage, and it’s imperative that Navani dies this turn before your opponent can play a Deepforged Plate on it. Which blocker do you choose? The Rhinarc, or the Harbinger? The answer, it turns out, is both. While the Rhinarc is the only unit that can kill Navani, the Harbinger will deal its damage to her as well, netting you three free points of health from its Lifesteal effect. In addition, there’s always the chance that your opponent might play a small combat trick like Finest Hour, putting Navani at 7 strength and 7 health – enough to kill the Rhinarc and live, but not enough to survive the combined 8 strength and 10 health of the two units together. A “Chump” block is when you put a small unit in front of a larger one for the express purpose of preventing damage to your person. The chump always loses – that’s why it’s the chump – but it saves you health in the process. In general, you should avoid chump blocking when you have health to spare, since the more small units you play, the better your trades get. A single 3/3 can chump a 3/4 Siraf once, or it can wait until it’s joined by another 2/2 next turn. Both units can then block Siraf for a good trade. By that same token, you should always force your opponent to chump block if you can! The result is either a clearer board for you or extra damage to your opponent. Unless you’re perilously close to dying, you should never pass up a chance to force a chump block. If you really want to get the hang of attacking and blocking, play Gauntlet and Arena and watch your computer opponents carefully. They always try to choose the smartest blocks for a situation, and they’re remarkably well programmed in this respect. They’ll almost always assign multiple blockers correctly, and they generally only chump block when facing lethal damage (more cautious players might try to save just a tad more health than that, but the brutal efficiency of the AI is something to be respected). They’re still suckers for a good combat trick, though. Before we close out for today, there are a few skills we want to keep in mind when choosing attackers or blockers. For example, a unit with Lifesteal on defense makes attacking less appealing – a 1/4 Karmic Guardian can always block a 3/3 Argenport Instigator and gain one health for her side while doing it. Three skills that you should certainly be aware of when choosing blockers are Quickdraw, Overwhelm, and Deadly. Quickdraw units have a special rule that allows them to deal their damage FIRST when attacking, removing units from play before they can deal damage back. So a 2/2 Rakano Outlaw will survive a fight with a 3/2 Argenport Soldier. Adding extra blockers can help against these units, but remember that it’s not just about exceeding the Quickdraw units strength value: you must have units tough enough to kill. So, blocking with a Scaly Gruan and an Argenport Soldier, for example, gives you 4/6 in stats, but once the Soldier dies to Quickdraw, only one damage is left. You’d be better off just blocking with the Gruan! Overwhelm units “splash” extra damage onto the enemy player. This is mostly important when defending yourself against lethal damage, but it’s worth paying attention to. For example, a 6/5 Overwhelm Pyroknight can be killed by a 5/5 Rhinarc, but if you block with the Scaly Gruan as well, you’ll take no extra splash damage (though you are more vulnerable to a trick). Deadly units always trade evenly with other units, which makes them potent defenders and attackers. They need only deal one point of damage to any unit, so a deadly unit can kill as many blockers as it has points of strength. Deadly units also have strong interactions with Overwhelm and Quickdraw that are important to note. For example, Ashara, the Deadshot has Deadly and Quickdraw together, which means that if she’s blocked by six other blockers, she’ll do one point of Deadly damage to each of them, killing them all before they can deal damage back. Champion of Chaos has Deadly and Overwhelm, so even if it’s blocked by a large unit like a 5/5 Rhinarc, Champion of Chaos will deal only one point of deadly damage to the 5/5, and the remaining 4 points will splash over to the enemy player. Keep these interactions in mind! Combat is a crucial element of Eternal and the more you know about how to manage it, the better your games will go. Always look for the best possible trades, keep your eye on the board and your opponent’s possible tricks, and use your own tricks wisely or at least pretend that you have some. Finally, don’t be afraid to make a few mistakes! Practice hard enough and you’ll be able to read every battlefield like an open book – but that level of expertise only comes if you’ve seen all the pages before. Good luck out there, and good games to you all!